I may not be an excellent chef, but when the time calls for it, I can make a hell of a cocktail. The best part about this cider recipe is that it's hardly a recipe at all -- which is perfect for anyone like me who really just wants to impress party guests with a delicious drink... and then warm them into highly entertaining conversationalists with just the right amount of bourbon. I've tried a few variations on this cocktail, taking inspiration from Pinterest searches and using good old fashion intuition. I made it with 100 percent apple juice in a pinch recently, which my roommate liked because it was a touch more sweet and cut the whiskey a bit more. 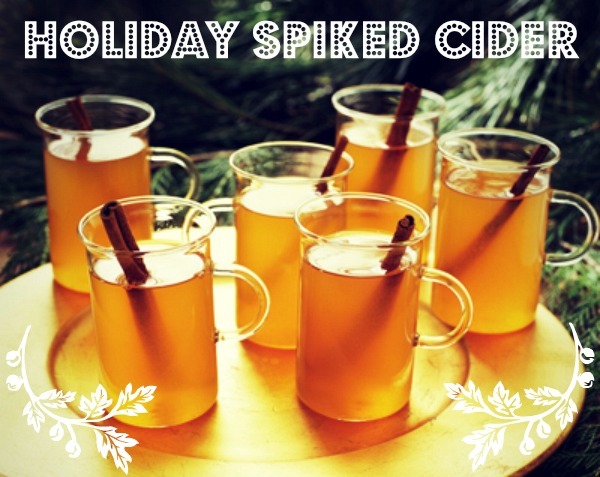 But, I prefer a true cider to get the "spiciest" and most seasonal flavor. 2. Ladel hot cider into glasses or mugs, just a bit more than 1/2 full. 5. Break cinnamon sticks in half and put a piece in each glass (you can definitely use a whole one for more flavor). 6. Peel a generous amount of orange rind and add a big piece to each glass. Cheers! You're now basically a master mixologist ready to impress family and friends this holiday season. i'm stashing this away for a chilly snowy evening! AND IT IS SO GOOD! I cannot wait to try this! Hot bourbon or whiskey drinks are always delicious!